well nokia can start thinking about leaving the mobile industry and focus on some other things because the more constumors wait the more they are disappointed. same old crap, nothing innovative and the worst of all that they generally cost a fortune! 5800 with a keyboard small screen! Fail again Nokia! Will go to android, X10 or the Nexus One or maybe wait for the samsung galaxy! Anonymous, 13 Apr 2010This is in direct competition with Vivaz Pro. The Sony Ericsson unit ofcourse has no chance as... moreno its not. vivaz pro is lighter, smaller, better cam, better video recorder, better battery life and sexier. os.is the same, same screen size. chirash, 13 Apr 2010This is not fair.. n97 mini is for Rs20,000 this C6 is for Rs 13500 only.. good going nokia.... moreHow do know about the price of c6? Its not released yet. Anonymous, 13 Apr 2010same as n97 mini notheing to be exited about :PYeh, it's the same. Why on earth is it thicker, broader and heavier than N97 mini. The battery and screen are the same (if its not an AMOLED screen). This is in direct competition with Vivaz Pro. The Sony Ericsson unit ofcourse has no chance as it'll be under promoted and under sold as is the case with SE. Can we have a specification on the hard ware front. The Processor and the RAM and the ROM? The screen could have been a little fuller for the front estate of the device. Its basically a 5800 with keypad. 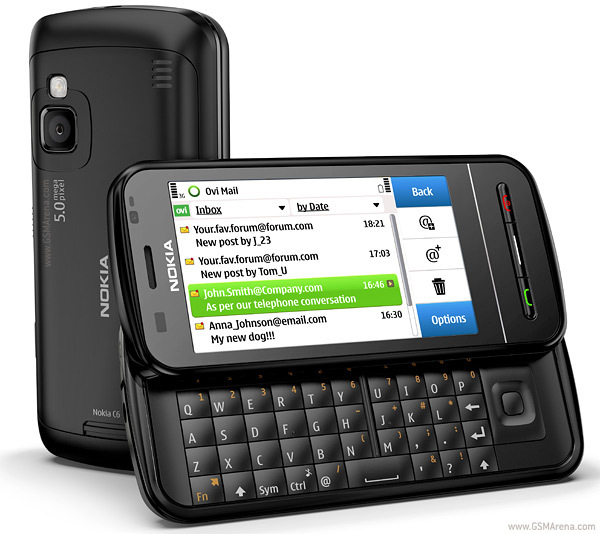 Yep, same as n97 mini, but if they keep the price low i think it will be a success. There are a lot of apps that make symbian fun to use. although it won't be as fast or as smooth as other OSes i think it will be just OK.
Amazing cell i think its just like a n97 but how much its price?????? Does it really have face and smile detection? I think GSMArena has got it wrong. because nokia phones dont have this feature.